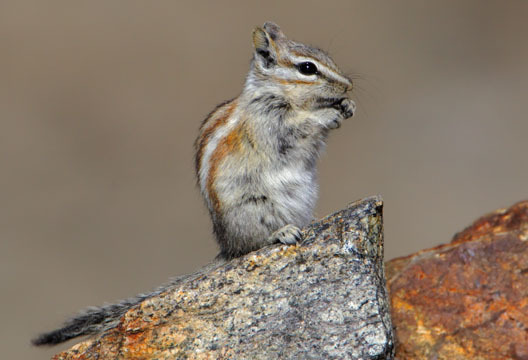 The Alpine chipmunks are small grey colored species dotted with light stripes on the tail and the back. They tend to store food and hibernate in winters. These species are essentially found in the regions of higher altitude ranging from 2300 to 3900 meters. 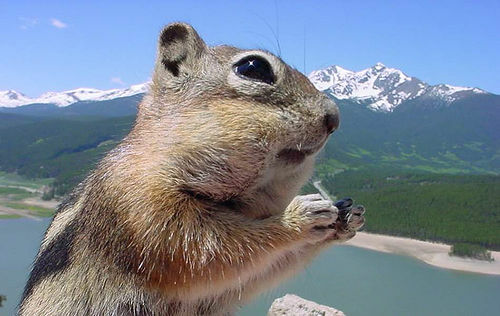 In 1983, Merriam was the first person to report about the Alpine Chipmunks. These species essentially belong to rocky alpine region and are mainly found in Yomesite and Sierra Nevada. Alpine chipmunks belong to the smaller category with few contrasting stripes and weigh about 80 grams. The size of their cheek is three times bigger than their head. They reportedly take their food in the pouches located within their cheeks to their holes. They can carry about 8 to 9 nuts at a single occasion. These species are known to preserve 8 pounds of food in the hole. However, these species do not preserve food to retain the body fat during the periods of hibernation which stretches from November through April. These chipmunks mate in the early spring and give birth to 3 – 6 young ones. The territorial range of these species is very restricted. One can spot these chipmunks in the Yomesite National park and Sierra Nevada, California. 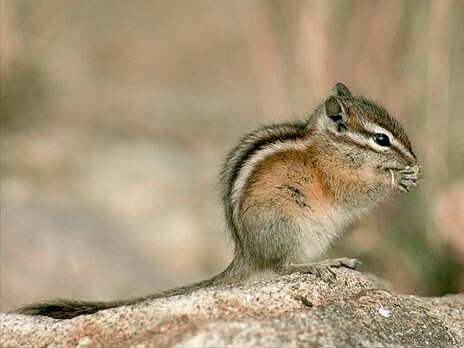 Size of Alpine Chipmunk: The size of the female is about 177mm while that of the males is 174 mm. 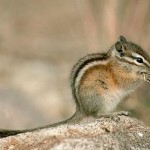 Weight of Alpine Chipmunk: The weight of alpine chipmunk varies from 27.5 kg to 45.5 kg. 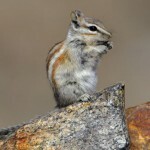 Color of Alpine Chipmunk: They are small light grey colored animals who have some light and dark marks on their cheeks. While the outer portion of their body is reddish, the inner portion is black. We take a quick glance of certain unique behavioral traits. These species are usually diurnal in nature. However, in the summer months they remain active during the nighttime. These species hibernate during November to April. Their cheeks are three times bigger than their head. These species take their food in the pouch and put them in the holes. These species rely on various food sources and can live without water. Their diet mainly includes pines, seeds of sedges, alpine plants, fruits, forbs, berries, fungi grasses etc. These species usually dwell in the high altitude land areas ranging from 2300 to 3900 m above sea level. These species are scarcely found at 2300m altitude. One can spot them in the rocky areas, slopes, rock slides and rock aligned meadows. These species hibernate during November to April. They seldom come out for food. They do not store fat layers in their bodies and instead hunt for seeds for summer months. The breeding time for these chipmunks starts in the initial days of spring. These species prefer to mate in the gaps of the rocks. The pregnancy period lasts for about a month and they usually give birth to offspring in the months of June and July. Each pregnancy results in the birth of 3 – 6 babies. The juveniles remain in the hole for about six weeks until they are grown string enough to collect their own food. Proper Housing: These species are very active and are mostly found having fun. Their place should be big enough to allow them enjoy play .The ideal dimensions of the place should be 6 ft. by 6 ft. by 4 ft. One can also make use of woodshedding and pined cage for their habitat. 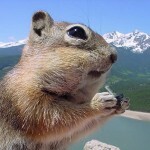 Proper Food: Alpine Chipmunks prefer to have nuts. One should make sure not to give too many of those as these species already store huge fats in their body. Ample amount of carrot, berries, \ turnip, apples, meat pieces and fruits should be good. In addition to this water should available at all times. Proper Handling: It is always good to keep two or three chipmunks together since fun is always in living together. They get pampered with patting. Proper Grooming: Their coop should be regularly cleaned and fortnightly activity would be ideal. As for self-cleaning, these species can clean their body themselves. 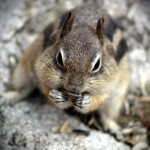 The alpine chipmunks are commonly available at any of the pet shops. 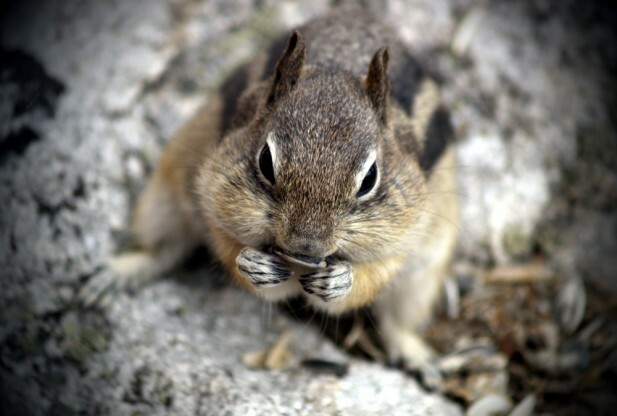 Healthy chipmunks that are about 6 – 8 weeks old should be preferred. They are lively creatures with beautiful fur. Construction of their habitat should be rodent resistant. Food items need to be preserved in the rodent holder. Naphthalene should not be kept around them. Snap traps should be well in place. The average life span of these species is 2 – 5 years. These species are not endangered. However, there are no laws to protect them.